Following the Academy’s successful panel meeting on June 28th, I’ve given much thought to the challenges inherent in transforming a lackluster commercial-retail area such as lower State Street and would like to offer my vision on how such a transformation could take place. During the 1980s, the Third Street retail corridor in Santa Monica was experiencing the same problems that lower State is experiencing now: high vacancies, homeless entrenchment and little to no public engagement. It was basically a ghost town. So what did the city do? They closed Third Street as a thoroughfare for vehicular traffic, built an attractive mall facility in the Third Street Promenade, built strategically located parking structures and took efforts to bring in unique, boutique storefronts into the area. By the 1990s, Third Street became a popular Westside entertainment zone and people would travel from all over Los Angeles to meet up with friends and enjoy the cool coastal weather. I believe Santa Barbara can achieve the same result. Below is a short presentation outlining some structural concepts that I believe could completely change how lower State Street functions and engage both citizens and businesses to reinvent the blocks leading south from Sola to Gutierrez streets as distinct, interconnected communities. This presentation is also available for download as a .pdf file. As with Santa Monica, it requires that State Street be permanently closed to vehicular traffic, other than bicycles and certain low-speed electric transportation. This would effectively change the area’s polarity from a situation in which State Street splits adjoining blocks to a new configuration where State Street becomes a common area space for public events that binds the two blocks as a distinct community in an interconnected chain. 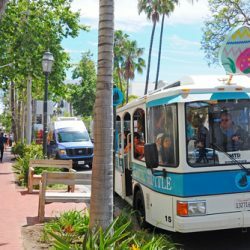 This new configuration acknowledges and relies upon what has worked in Santa Barbara for decades: the north-south transit corridors of Chapala and Anacapa Streets. Seriously, other than tourists, who use State Street to navigate this space? It’s much easier to take a one-way corridor to the nearest cross street. This new configuration just closes the circle. The final component would be developing a phone app to serve as a central platform on which to inform residents and tourists of venues, events and more importantly, the nearest parking area to their chosen activity.